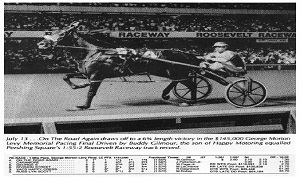 "Celebrating 48 years of History And Memories at: www.rooseveltraceway.com"
In 1980, Niatross won of the Triple Crown of Harness Racing for Pacers and in the harness racing world where records are broken by fifths of a second, Niatross obliterated the world record by three full seconds, setting an astonishing mark of 1:49.1 at Lexington, Kentucky's "Red Mile." 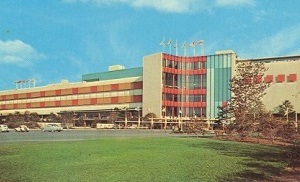 During his racing career, Niatross won 37 of 39 races; in one of his losses he broke stride and in the other the horse, sulky, and driver all flipped over the racetrack's inside rail. Fortunately no one was hurt. He recovered and went on to beat all of his competition easily, frequently setting track records including a new race and track record during the prestigious Prix d'�t� at Blue Bonnets racetrack in Montreal, Quebec. By the time Niatross retired to stud at Castleton Farm in 1981, he had earned more prize money than any standardbred horse in history. 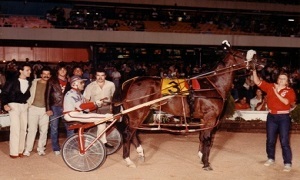 He had been named Harness Horse of the Year in 1979 and 1980, the New York Post Athlete of the Year in 1980, and Harness Horse of the Decade for the 1980s. 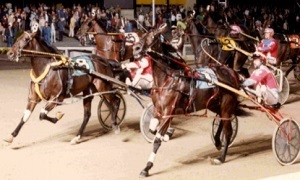 In stud, he commanded a top price for his services which proved worthwhile with great offspring winning the Little Brown Jug and one, Nihilator who would go on to win Horse of the Year honors. In 1996, when he was 19 years old, Niatross made a 20-city tour for his fans in Canada and the United States. In 1997, Niatross was inducted as a member of the Living Horse Hall of Fame. The Photo Gallery Features Scenes from Roosevelt Raceway that fans experienced. The Winner's Circle features photographs of winner's throughout the years. © 2014 The Roosevelt Raceway Memorial. All rights reserved. | Photos by Fotogrph | Design by TEMPLATED.